"No more 'Twilight' sequels, do you hear me? NO MORE." This week in movies you missed: Robert Pattinson sports bad teeth and a bizarre Southern accent in a bleak futuristic Western from director David Michôd (Animal Kingdom). A title card tells us 10 years have passed since the global "collapse." In the sparsely populated Australian outback, Eric (Guy Pearce) is minding his own business when three punks fleeing a robbery happen along, crash their car and steal his. That was a mistake. Because Eric will do whatever it takes to reclaim his unprepossessing vehicle, and he has no qualms about killing those who stand in his way. By chance, Eric encounters Rey (Pattinson), younger brother to one of the car thieves (Scoot McNairy), who was shot and left for dead during their initial robbery. For medical treatment, Eric brings Rey to a doctor (Susan Prior) who lives a hermitic existence, caring for the pet dogs that refugees have left behind. The younger man is sufficiently grateful — and desperate for companionship — to lead Eric toward his brother. But can he predict the inevitable consequences? 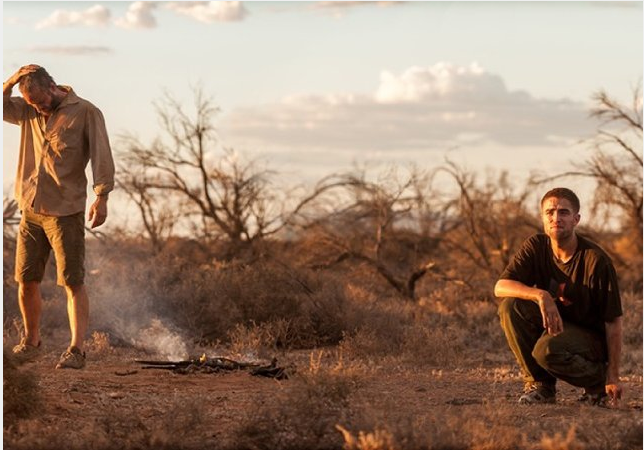 The Rover premiered at Cannes last spring and reached 608 U.S. theaters, none here. It's now on DVD/Blu-ray and available on iTunes and Amazon Instant (not Netflix Instant yet). Let's forget the 20-point scale this time and imagine a dialogue between a 16-year-old R-Patz fan and her dad, a 45-year-old cinephile, who watched this movie together. Daughter: UGH. I can't believe I watched that. Dad: I'm glad I did. I thought it was a fascinating new take on the well-worn Mad Max tropes with exquisite cinematography and the minimalist pacing and plotting of a Western reimagined for a nihilist age. Think The Proposition meets The Road. Daughter: Dad, when you say "minimalist pacing and plotting," I think you actually mean nothing happened. Because nothing happened in this movie. After the first 15 minutes, I was on my phone the whole time. Dad: Well, maybe the real problem here is the way you watch movies. Daughter: So I'm not the most patient person in the world. I like to be entertained. But if you wrote down everything that actually happens in this movie, I think you'd see it goes in circles. Everything is just a meaningless tangent from the main plot of that old guy finding his car. "Old?! Well, that's just, like, your opinion, man." Dad: I'm going to forget you just said that about Guy Pearce. Daughter: No, listen. First of all, the old guy's a jerk, not a sympathetic character. As soon as we see him [spoiler redacted], we're like, "Whatever, dude, go find your car, but you can rot in the desert for all I care." Dad: He may be a jerk, but he's a consistent character, a hard man in a hard landscape. Didn't you think his backstory was revelatory? Daughter: Honestly, I think I missed that. It was all mumbly, and by that time I just didn't care about anything. Anyway, my second point is, we already know what's gonna happen when Eric finds the thieves. The only mystery is why he loves his car so bad. And when we finally find out that [spoiler redacted], I mean, whatever. I was not impressed by this "twist." Dad: I found the coda a bit lightweight, myself, but I think the point is that you never know what might motivate a person. Daughter: Whatever. My favorite scene was the one where R-Patz is in the car listening to "Pretty Girl Rock" by Keri Hilson, because at least I could dance along. Dad: Didn't you feel the pathos in that scene? Society has been reduced to a shambles, people eking out a meager existence in the desert, killing and selling one another to survive, and here's this song from another time when the biggest problem a first-world girl had was deciding which boy to date. Daughter: We have more problems than that, Dad. Sheesh. Anyway, I don't understand why Robert Pattinson was even in this movie. He had nothing to do except look sad. His character wasn't, like, the sharpest tool in the shed. And WTF was up with his accent? If this is Australia, why do he and his brother sound like they just climbed out of an American swamp? Dad: I think the point is that Americans have fled to Australia. Or something. But listen, here's a conundrum for you. How can a girl who watched every single Twilight movie tell me that not enough happens in this one? Or that Pattinson is misused? It's not the world's most memorable performance, true, but I think we can agree that at least he isn't just standing around looking pale and constipated. His character exudes an inchoate, childlike longing that I found affecting. Daughter: I'm not saying he deserved any Oscars for Twilight. But why do actors who want to show off their acting always put on bad teeth and a weird accent? It's not impressive, it's annoying. Dad: I think we'll just have to disagree on the merits of The Rover and hope that you never have to deal with the aftermath of a "collapse" in your lifetime. Daughter: I can tell you one thing: If it happens, no way I'm immigrating to Australia. Not even if R-Patz is hanging out there. Because it looks dire. Verdict: Recommended mainly for 45-year-old cinephiles and other hard-core appreciators of mood and cinematography, but I'm sure R-Patz fans will see it anyway. The makers of Coraline bring us a new stop-motion animation, The Boxtrolls. Denzel Washington defends the city's lost souls in The Equalizer, which reportedly has lots of action and not much to do with the TV series. At the Roxy and Savoy, an older gay couple ties the knot and runs into trouble in Love Is Strange, already an art-house favorite elsewhere in the country. Only at the Roxy, Bill Hader and Kristen Wiig are more sad than funny in The Skeleton Twins, and you can vote for your favorite of 10 short flicks in the Manhattan Short Film Festival. Love Is Strange, The Boxtrolls, The Rover, and The Skeleton Twins are not showing in any theaters in the area.